Frank Lampard is ready for a return to action. Derby County head to Rotherham United this weekend as they aim to make it five wins in a row in all competitions. The two-week international break ends with four games in ten days for the Rams, beginning at the AESSEAL New York Stadium and ending at Old Trafford in the Carabao Cup. 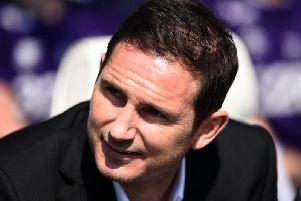 And with a great run of form behind them, Lampard is aware Derby will have to again be at their best to beat the Millers. He said: “It will be a really tough game against a Rotherham team who are well organised. I have watched a lot of them and they have picked up some good results this season already. I’m not taking it lightly, it will be a difficult game for us and we will need to perform at our best. “The break was a good time for us because we had a lot of players who had broken pre-seasons. That included some of the new signings and some of those already here, so it was nice. The Rams ticket allocation has sold out for Saturday's game and Lampard is delighted to again have the fans' backing. He said: “We need them and we appreciate them. We saw at Hull for two games in four days that they turn up and show the level of support like they do, and they will do it even more so at Rotherham. A number of Rams players featured for their respective countries during the break and Lampard is happy with how his players got on. “Everyone is back so it’s good news,” he said. “We had some good appearances and performance for our lads across the board so I’m happy to have the players back together. With regard to those who have been carrying injuries, there is positive news on their progress, albeit not quite quickly enough for this weekend.